Okay, I just recently declared the Bolse 5-port USB desktop charger my favorite gadget of 2014. Now along comes the Truffol Station 5 with very similar functionality wrapped in a handsome wood exterior. It could look great on my nightstand! Can a pretty face lure me away from last year’s true love? Let’s take a look. Consistent with the “natural” image that Truffol is creating for this product, the packaging for the Truffol Station 5 is recyclable brown cardboard wrapped in a paper sleeve with a wood-grain print. I’m happy to see packaging that is environmentally friendly. Inside I found the charger, with a couple of surprises. The first surprise was a coupon on top thanking me for my business and providing a 10% discount on future Truffol purchases. Discounts are always welcome and, in this case, a reason to start off buying one Truffol item before shopping their range of accessory products for audio, power, phones and smart watches. The second surprise was the separate power adapter. I have mixed feelings about this. On the positive side, I’m sure that separating the adapter electronics help reduce the size of the desktop charger component. Indeed the wooden enclosure is slightly smaller than my Bolse charger (with integrated AC adapter). But it comes at the cost of this extra brick. 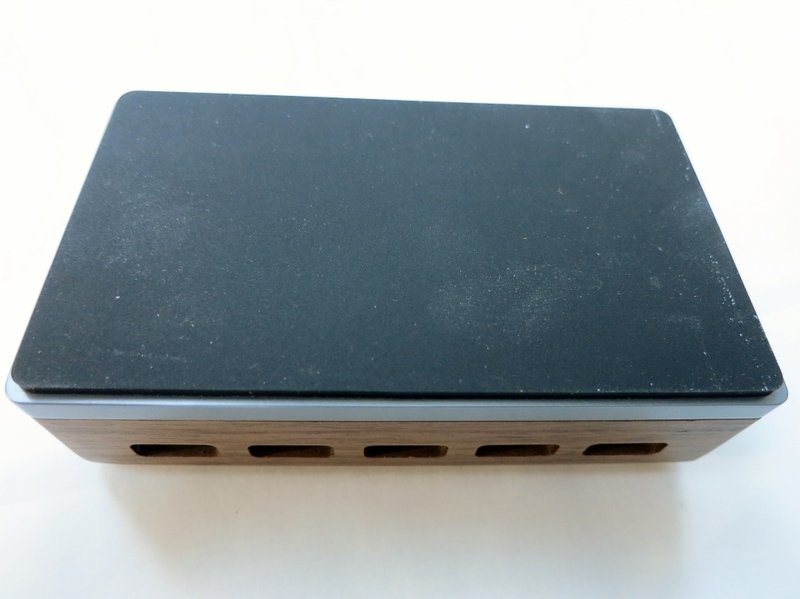 At about 3.75” x 1.75” x 1.1”, the brick isn’t huge and it needn’t sit on the desk or nightstand. However, it detracts from the overall elegance of the product and would make this product more awkward than the Bolse to pack and carry. 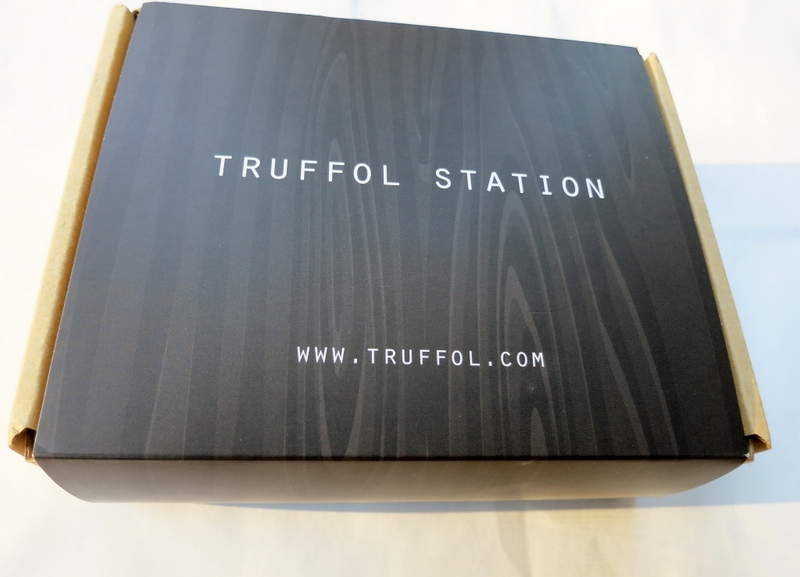 Due to this, as well as the potential for scratching the wooden case, I would tend to purchase the Truffol Station 5 for use in a permanent location. Dimensions: 109 x 63 x 34 mm / 4.3 x 2.5 x 1.3 in. I made a quick note that the total output specs, at 39W, are greater than the 36W provided by the power adapter, but most devices probably won’t draw the full current. 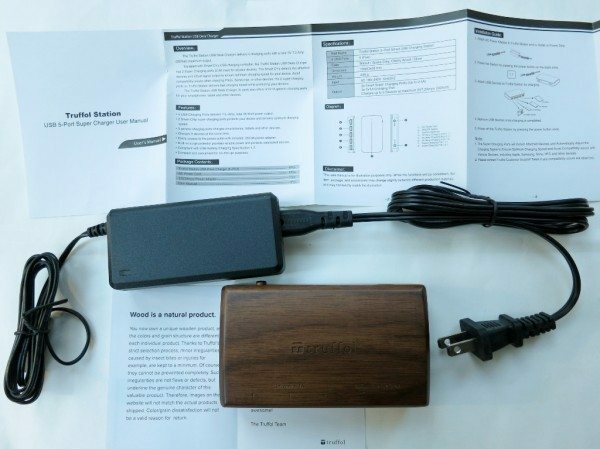 The Bolse charger is 40W and, while the higher-output ports are only rated at 2.0A, there are three of them. 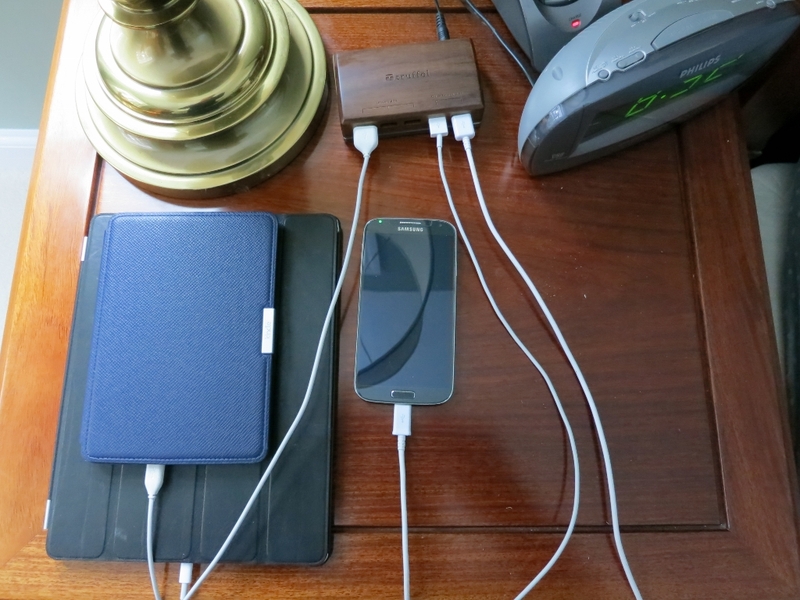 As power-hungry phones and tablets proliferate, this seems to be a preferable configuration. Nevertheless, the Truffol Station 5 is a beautiful product! I chose black walnut to blend with my dark rosewood nightstand, but a lighter cherry option is also available. The wood cover is complemented by an aluminum base with non-skid rubber to keep the charger in place when plugging and unplugging cables. 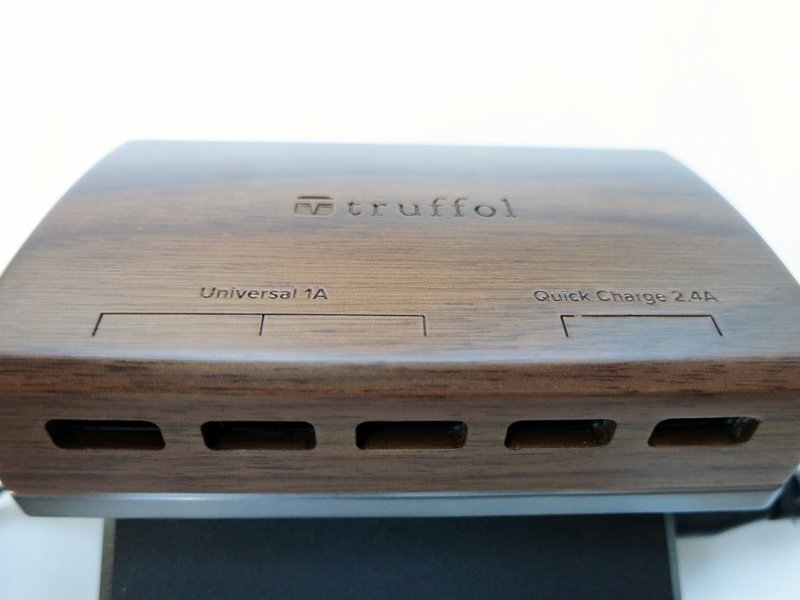 The Truffol logo and charging port labels are engraved on the curved top. The overall aesthetic is elegant and pleasing. 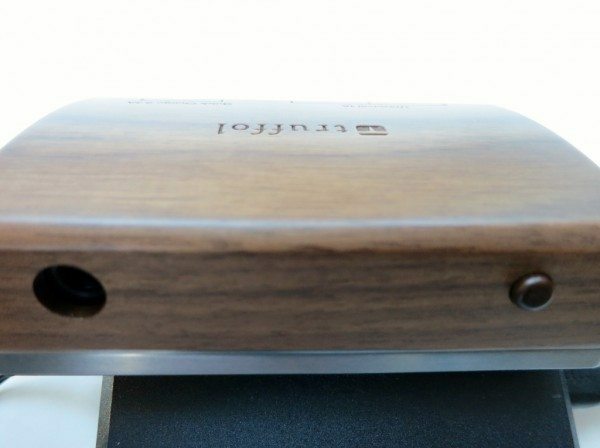 The back of the charger has a port for the charger cable and an on-off button made of wood. I don’t quite understand the purpose of the on/off switch. I doubt that it helps much with energy conservation, because it doesn’t turn off the power adapter (or its LED) and devices should stop drawing power when they are full. There is no external indication of whether the switch is on or off, so you must look at your device when you plug it in to confirm that it’s charging. I complained about the bright light on my Bolse charger, but that’s because it’s a very bright light on a device that always on when plugged in. 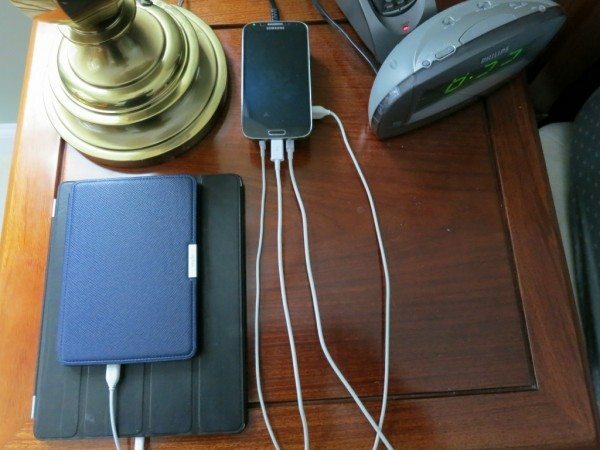 The Truffol Station 5 device is just the opposite, and thus more annoying because it’s easy to plug in your device overnight and wake up to a dead gadget. The bottom of the Truffol Station 5 is a soft rubber mat, to help prevent both sliding and scratching. I did notice, however, that the weight of the power adapter, when I left it dangling in midair behind my nightstand, was sufficient to drag the charger askew. If you’re frequently plugging and unplugging cables, you may want to put the adapter on the floor to offload the strain on the power cable. Here, the phone sits neatly atop the Bolse charger, accomplishing the dual purpose of reducing my overall device footprint and hiding the bright orange light. (I’d dearly love it if Bolse were to add Qi charging capability to the top of its charger, making it nearly perfect, but that’s another article.) Anyway, the Truffol charger, with its curved top, forces me to set the phone down elsewhere. It’s hard to fairly call this a design oversight, but for me it is a loss of functionality. In addition, since my black plastic charger is typically hidden by the phone, I place less value on the upgraded aesthetic of Truffol’s natural wood material. Does the pretty box perform on par with its plastic predecessor? Not quite, based on my limited testing. I don’t have ammeters for comprehensive testing and relied only on what my devices told me. The Kindle simply showed that it was charging. The iPad indicated that it was charging when plugged into the 2.4A ports and not charging in the 1.0A ports, consistent with my experience with the Bolse charger. However, my Samsung phone reports not only whether it is charging but also the time to a full charge. I figured I would use this to compare the performance of the Truffol and Bolse chargers. The results were interesting. With my phone at 53% capacity and connected to the Bolse charger, it showed a time of forty-seven minutes (0:47) to full charge on the 2.0A port and 2:21 to full charge on the 1.0A port. When I plugged the phone into the Truffol Station 5, it also showed 2:21 to full charge on its 1.0A ports. However, the phone reported the same 2:21 to full charge when plugged into the Truffol’s “Quick Charge” 2.4A ports. I initially observed this when I initiated charging by plugging in the phone and then pushing the power button on the charger. A couple of times I got the phone to report the faster 0:47 time by unplugging the cable and reseating it in the 2.4A port; I thought that I might always need to do this after a power cycle to achieve faster charging. However, in just as many instances I found that reseating the cable had no effect. I tried another USB cable – the official Samsung S4 cable – and never saw the faster charge reported despite several attempts. Could these results be caused by faulty device reporting, bad cables, or other factors? Perhaps, but the phone reported the faster charging times consistently when connected to the high-amp ports on the Bolse charger. Even though I generally charge overnight and have plenty of time to juice up, I lost a little confidence in the Truffol charger’s ability to deliver power quickly when I need it. At $40, the Truffol Station 5 USB charger costs almost twice as much as comparable but less attractive products like the Bolse 5-port USB Desktop. If you really love the look of natural wood, it may be worth the extra money. While I do appreciate the elegant appearance of the Truffol charger, the pointless power switch makes me pause. The external power adapter makes me scratch my head a little more and realize that I won’t reach for this when traveling due to its extra weight and bulk. The curved top that takes away the charging bed for my phone means that I won’t be using this on my nightstand. Finally, the inconsistent performance readings cause me to lose some confidence in the product’s quick-charge capabilities. USB charging stations are great, and I like this desktop design that makes the ports available on the desktop. I’m also glad that Truffol has recognized that these products are often located where people value style and appearance. Functionality remains important, however, so I reluctantly conclude that one can do better than the Truffol Station 5. Source: The sample for this review was provided by Truffol. Please visit their site for more info about this product. the sheer size of that power adapter is amazing :[ i have right here a chinese 6-ports charger that doesn’t look bigger than the truffol charger, and yet includes it’s power supply… sure, it’s not wooden ..
@nickie Thanks for your comments. 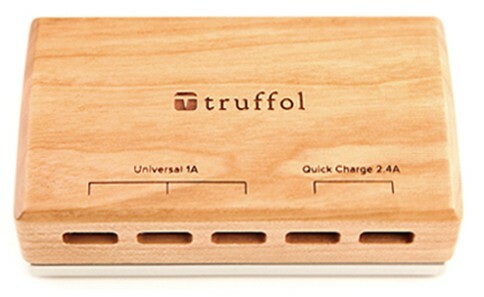 Truffol says that their product is a “collaboration” with Orico, who offers a plastic-cased product very similar to the Truffol Station 5 (although advertised as 40W rather than 36W) for $26 on Amazon. The ports look the same, and the size looks like it could be enough smaller to be what’s inside the Truffol wood box. The big difference is that the Orico product picture shows a simple cord straight from wall outlet to charger – no power adapter! It makes me wonder if there was a heat dissipation problem with the wood enclosure that forced them to add the external adapter. As for Samsung support, you may be right, although I’m still confused about why my Samsung S4 occasionally does seem to detect the quick charge port. My phone is specifically listed on the Amazon site as supported, although the user guide requests that users report compatibility issues with specific phones. My Bolse charger has a specific 2A port labelled Samsung, so they’ve taken an extra step to support my phone, which I appreciate. Anyway, I could see maybe paying an extra $14 for the appearance upgrade, but it’s not for me given the compromises on the power adapter and Samsung compatibility. Great example of form over function. It’s pretty… but there are many better products. I have two Anker 40W 5-port chargers. No power brick. Smaller than the reviewed device. And auto-senses current draw so any of the 5 ports can be used for 2.4A devices (up to 8A total, so if you plug in 4 iPads they’ll all charge a bit slower).